KSMR900(700)(600)/76(65)(43) tunnel sterilization dryer is mainly used for sterilization and drying of 2ml-20ml antibiotic bottle, it also can be used for pharmaceutical factory ampoule, oral liquid bottle and other medicine bottle. This machine is mainly composed of front and rear laminar boxes, high temperature sterilization chamber, machine frame, conveying belt, air exhaust and electrical control box. 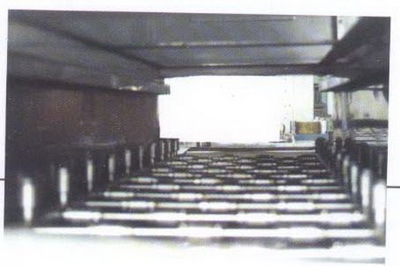 The heating uses air laminar the front and rear laminar boxes and high temperature section are all independent air cleaning system, hence it efficiently ensures that the antibiotic bottle, after entering tunnel, is under the protection of 100 class clean air, its production procedure conforms to GMP requirements. 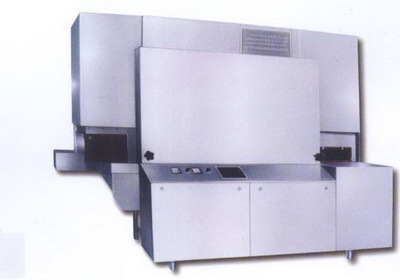 This machine uses surface cooler technology, it completely realized no-suction and zero-discharge. The air rate of each laminar blower is controlled by advanced AC frequency inverter technology. The automatic cooling protection technology of hot wind blower unit is our factory patent. The system exhaust blower uses the latest magnetic plate type motor direct driving which is out of our factory patent, it has compact structure and low noise, and it is easy for maintenance. The highest hot wind laminar temperature can reach 300℃-350℃, its technology fully reached the stipulations of China Pharmacopoeia and USPXIII. This machine has quick temperature rising, the time for a empty box temperature rising to 300℃ is about 20 minutes, during this time, there are 3-6 points temperature records and displays, the operator can observe and recod the oven temperature at any time.